I now have three painted and converted dreadnoughts and I've long owned a forth Forgeworld one which will soon see some paint. 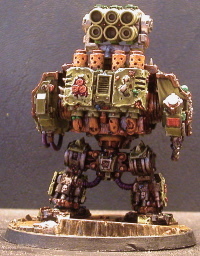 I figured my scratch built Defiler had more incommon with the Dreads than the Tanks. I ordered some of the new tank sprews and this was the first model I assembled with the benefit of them in my bitz box. I also used my Dremel on the Dread to grind off the ridges I didn't need so I could glue on stuff I did want like the monster head which is my heavy flamer. This model is quite well painted and uses my new tiny line style of highlighting. The arm graphitti is a second reference to the model's name. For a model that has only seen the field of battle a few times I put a lot of time and effort into it. Due to my almost complete lack of heavy weapons (using a pure Plague Marine army) I converted and painted up Toe Jam for the Grand Tournament in Calgary. 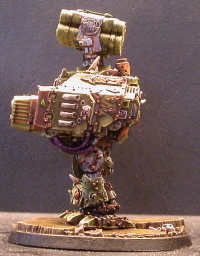 Basically its just a plastic loyalist dread with some chaos bitz and a lot of battle damage. 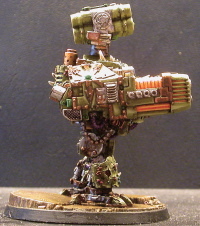 The conversion is tied together by the "tiny lines" paint job. What can I say, Chaos got something unique, it didn't have a model so I built one. I switched from the standard armament as it was what I gave to Rabaan. I have no clue what to do with it in a game. I plan to protect it from Hand to Hand and fire as many battle cannon shots as I can. But if I have to move I'll just have to live with 5 shots from it's heavy weapons. Having tried it out at the first Vancouver GT I think indirect fire would make it better. 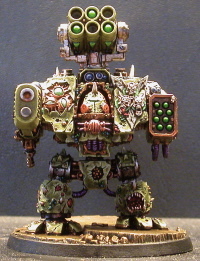 Is my converted Nurgle Forgeworld Dreadnought that I painted to be a centerpiece model for my third grand tournament. The first practice game in which I fielded it, Billy was overcome with Blood Rage and charged twelve inches into a river bed in front of the entire Imperial Guard army. Billy promptly died. Using the then current edition of the rules, if Billy can ever fire all three of his weapons he would be able to put four blastmarkers on a single squad. It is possible all four might have to be centered on the same model, at least two of them would have to be. Billy would have probably worked better in second edition where when template weapons missed they could deviate and still hit something, now only ordenance can do that. In addition to being a bane to large squads of lightly armoured troops a krak missile and a heavy plasma blast should also add to my force's anti-armour capabilities. Billy like Toe Jam sacrifices both an attack and his dreadnought close combat weapon in order to have a second heavy weapon. Heavy weapons are scarcer in my army than H2H capeability.